I feel your pain. I must have spent an hour trying to figure out a way to put the Etsy mini of my favorite picks into a blog post rather than in the sidebar and just could not get it done. It left me lying on the floor in a puddle of sweat. Your effort paid off though, you did it! Amy, I love the way you did that etsy mosaic. Now that I read it, I need to go to etsy and see what vintage dinnerware they have. lol! This is something I would not even attempt. I know I would never figure it out. 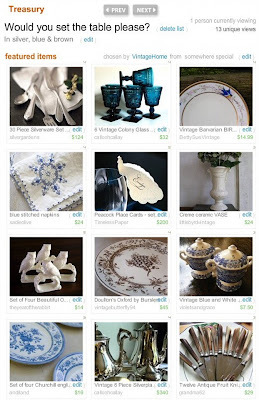 You did a great job getting it over....love the way your treasury looks! !